Something went wrong in the lab today... Very wrong... Or did it? 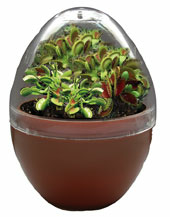 Never worry again about pesky flies or fly like men once you plant and grow your own fly trap plant! These little buggers just love to eat bugs and will have your pest problem under control just s soon as they are full grown!